Energy savings of up to 30% in hot air-conditioned rooms. 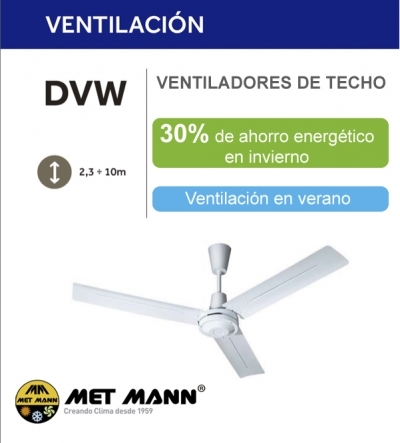 Our range of ceiling fans of 900 and 1,400mm in diameter are an energy saving system in premises where air heating systems are used and a natural cooling system in summer. The density of the hot air is lower than the cold air and by nature the warm air is stratified in the high areas of the room. So we are, a great amount of energy is wasted that can be recovered with our ceiling fans at a very affordable price and fast repayment. 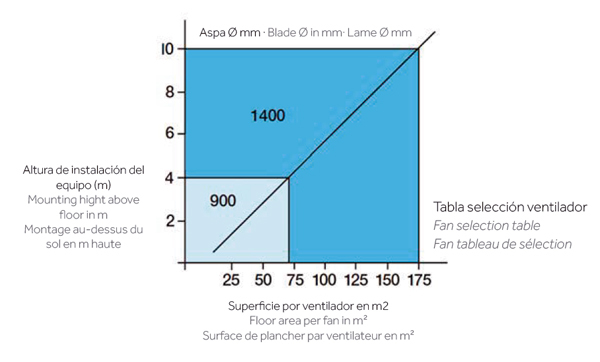 To calculate the number of fans required, you should look at the graph and depending on the height of installation tells us the m2 that can cover the equipment. For example: in a room of 500m2 and 6m in height the model DVW 140 covers us an area of ​​100m2 which should be installed 5 units of this model. In addition to being able to recover hot air, our fans have double direction of rotation and in summer you can choose to change the fan rotation and provide the hottest air at the top of the room and facilitate the work of installed air conditioners. If no cooling system is available, the temperature can be lowered by 2-3 ° C using the fan. You can access features and prices on page 64 of this catalog in pdf.